Innisfree is a fast-growing cosmetics brand in South Korea. In May 2014, the brand officially tapped into the bustling Taipei Eastern District and successfully built a green concept store that unites with nature. 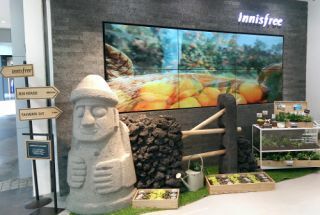 Through the use of CAYIN digital signage solutions, Innisfree hopes to combine nature and technology and further provide customers with a different in-store experience. To make the brand stand out in the increasingly competitive cosmetics market, Innisfree adopted a 2 × 3 video wall, composed of six 46-inch, 500-nit displays at the shop front. Through the deployment of CAYIN SMP-WEBDUO, a web-based digital signage player, digital content can be played as an extension of natural design and also combine with the in-store Jeju original decorations. Moreover, customers who come into the store can experience and enjoy the unique value of the brand through all of their five senses: sight, hearing, touch, smell, and taste.